Join Valerie Mark, C-IAYT, E-RYT (certified yoga therapist, International Association of Yoga Therapists) for a 5 week Beginners’ series. Class will meet on Saturdays for the month of June. 10:30-12:00 noon. Space is limited to 6 practitioners. The class is based on the Ashtanga Vinyasa Practice and will be tailored to the specifics of the individuals in the group. We will explore foundational asanas including sun salutations, standing and seated asanas, breathing technique, and how to modify the breath and pace of the practice to shift into a restorative flow. Pre-Registration is required. Please contact Elizabeth at atlantayoga@atlantayoga.com with questions or to register. Fee: $120. Women’s Trauma Sensitive Yoga Group begins March 13, 2018: I am pleased to be able to offer a new Women’s Trauma Sensitive Yoga Group (ages 18 and up) beginning March 2018. This group was originally to begin in May but due to the number of inquiries I am moving the start date up. The group will meet at 7:00pm on Tuesday evenings for 12 weeks. We will begin on March 13th. The group is limited to 5 practitioners to ensure individual support and guidance. The group is designed for support of complex trauma, PTSD, and anxiety and panic disorders. Yoga –gentle mindful movement– allows us to gently reorient to the body. It dials down the sympathetic nervous system’s stress responses interrupting what is for many a state of chronic hypervigilance. Once we can reorient to our bodies, we can begin the processes of reorienting to our environments and other people in our lives. An initial interview is required. Concurrent individual psychotherapy may be required. Fees are 45/session payable by the start date (payment plans are available based on need). Please contact me at atlantayoga@atlantayoga.com or 404.273.4388 if you have any questions or would like to begin the registration process. We invite you to join our Beginners’ Course starting Thursday August 10th. We will meet for 6 weeks, 6 classes. We will meet Thursdays at 7:30pm. This course is led by Elizabeth Rogers, LPC and C-IAYT (Certified Yoga Therapist with the International Association of Yoga Therapists). This gentle introduction to the Ashtanga yoga will introduce you to the foundational asanas (postures) of the Ashtanga Vinyasa practice, the fundamental breathwork, and individualized techniques for cultivating mindful movement. We focus on assisting each practitioner in developing an individualized practice in the traditional framework of the Ashtanga Vinyasa system as taught by Sri k. Pattabhi Jois. This course may be suitable for those seeking a trauma-sensitive yoga practice. Please contact Elizabeth for more information regarding this. This course is limited to 8 practitioners. Fees for the course are 108.00. Please contact Elizabeth at 404-273-4388 for queries or to register. Elizabeth Rogers has been teaching Ashtanga Yoga and working with individuals therapeutically for nearly 20 years. She is a licensed professional counselor (LPC) and certified Yoga Therapist with IAYT (C-IAYT). She has a particular interest in adapting the Ashtanga practice to individuals working with physical challenges, PTSD and complex trauma, anxiety and panic disorders, mood disorders and disordered eating. Elizabeth is the director of Atlanta Yoga where she leads small group classes and works with individuals therapeutically as well as with those interested in cultivating a more nuanced and refined practice. We invite you to join our Summer Beginners’ Course starting Thursday June 8th. We will meet for 6 weeks, 9 classes. Weeks 1-3 we will meet Thursdays at 7:30pm. Weeks 4-6 we will meet Tuesdays at 8:00 pm and Thursdays at 7:30 pm. This course is led by Elizabeth Rogers, LPC and ERYT-500 since 2007. This gentle introduction to the Ashtanga yoga will introduce you to the foundational asanas (postures) of the Ashtanga Vinyasa practice, the fundamental breathwork, and individualized techniques for cultivating mindful movement. We focus on assisting each practitioner in developing an individualized practice in the traditional framework of the Ashtanga Vinyasa system as taught by Sri k. Pattabhi Jois. This course is limited to 8 practitioners. Fees for the course are 162.00. There are two partial scholarships available. Please contact Elizabeth at 404-273-4388 for queries or to register. Elizabeth Rogers has been teaching Ashtanga Yoga and working with individuals therapeutically for nearly 20 years. She is a licensed professional counselor (LPC) and has a particular interest in adapting the Ashtanga practice to individuals working with physical challenges, PTSD and complex trauma, anxiety and panic disorders, mood disorders and disordered eating. Elizabeth is the director of Atlanta Yoga where she leads small group classes and works with individuals therapeutically as well as with those interested in cultivating a more nuanced and refined practice. *Trauma-Sensitive Yoga Thursdays 7:45 – 8:45 p.m. beginning February 23rd for nine weeks. This therapeutic yoga group is designed for support of complex trauma. This work is also effective for symptoms related to PTSD, anxiety, and depression. . Facilitated by Elizabeth Rogers, LPC, ERYT-500. Please contact Elizabeth [atlantayoga@atlantayoga.com or 404.273.4388] if you are interested in joining this group. Fees are $45/session and commitment to the nine-week session is required. *Mindful Movement Basics — Begins Sunday January 22nd, 12 noon – 1:15 pm. This is an 8 week Foundations course for All Levels including new Beginners. This course will cover the core asanas (postures) of the Ashtanga Vinyasa system, basic pranayama (breathwork), basic anatomy and gentle articulation exercises to support the development of mindful movement. With Elizabeth Rogers, MA, LPC. 6-weeks, $108.00. Please contact us to register. Please join us for a six week Asthanga Foundations course with Elizabeth Rogers. This course is designed for those completely new to yoga as well as those experienced beginners or intermediate practitioners new to the Ashtanga tradition. Elizabeth will work with each practitioner? to develop?a core practice that will prepare the practitioner for our regular Foundations classes as well as for the development of a self-practice.? We will cover the foundational asanas and breathwork with a focus on using movement to create new spaces in body and mind. Along the way we will also explore basic anatomy and alignment and several key concepts of this yoga tradition. Limited to 8 practitioners: please email Elizabeth to register at atlantayoga@atlantayoga.com. Back in West Midtown’s Arts District! Our new home in Atlanta’s Historic West Side community is a beautifully renovated church over 100 years old. The church is now Blue Mark Studios, an event space, art gallery, and artists’ studios. We are in one of the artists’ studios upstairs. Please join us! Our goal is to work with each individual in a class to support them in developing a practice of mindful movement that will support them across a lifetime. All class are small group classes and space is limited to eight practitioners for each class. Please contact us the day before your first class with us so that we can reserve a space for you in a class suited to your needs. Email is the best way to contact us: atlantayoga@atlantayoga.com. You may also call us at 404-273-4388 and leave a voice message. Messages will be responded to within 24 hours. Ashtanga Foundations Tuesday and Thursday at 7:30 p.m. If you are new to Atlanta Yoga this is our entry level class! Ashtanga Integrated Practice Monday and Wednesday at 8:00 p.m.
Ashtanga Primary Series Sunday 10:00 a.m.
We are moving back to our long-time home in Atlanta’s Midtown West Arts District! After a year away I am very happy to be moving back to the West Side! Atlanta Yoga’s new home is located in Blue Mark Studios at 892 Jefferson St NW, Atlanta, GA 30318. 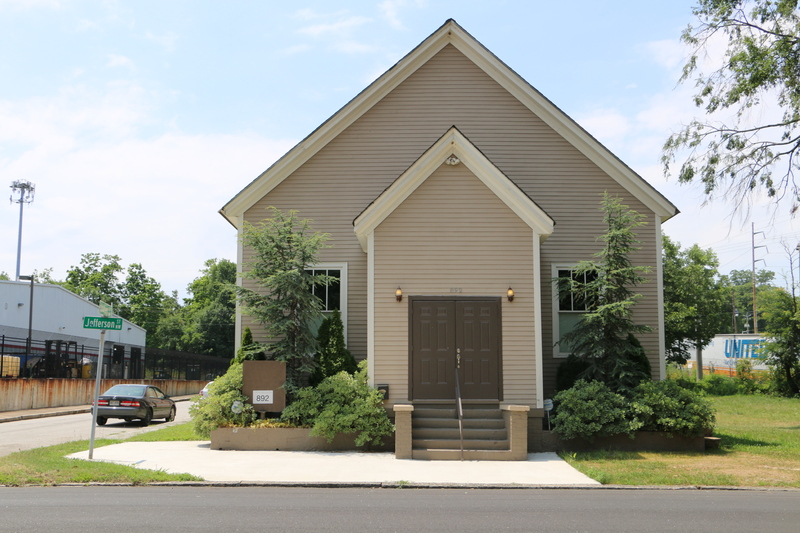 Blue Mark Studios is a beautifully renovated historic church off Joseph E. Lowery Boulevard not far from our former home at the King Plow Arts Center. Blue Mark Studios is home to artists, graphic designers, and an event space. I will be altering the Atlanta Yoga class schedule slightly when we move. The new schedule will be posted here, on the schedule page and on the Atlanta Yoga facebook page. Classes will continue to be small group classes — no more than 8 practitioners per class — so it will continue to be important that you pre-register by email. If you are new to Atlanta Yoga, please simply contact me by email at atlantayoga@atlantayoga.com at least one day before your first class. If you are a regular, I ask that you email your weekly practice schedule to me before 9 p.m. on Sunday. Classes will begin in the new space on Sunday July 31st! Mindful Movement: A New Ashtanga Yoga Beginners’ Series starts January 10th! Mindful Movement: Our next Ashtanga Beginners’ Series starts Sunday January 10th! Six weeks, nine classes.? We will meet Sundays at 11:45 a.m. for six weeks. Students will also take 3 Ashtanga Foundations classes (offered Tues and Thurs evenings) during weeks 4-6. Sunday classes will explore the techniques that structure the Ashtanga Vinyasa Yoga practice.? These include the core mindfulness practices of breath awareness, gaze awareness, and body awareness.To this end we will explore Sun Salutations and standing forms as well as the development of the breath and linking breath to movement. These technique classes are designed to work in conjunction with our Ashtanga Foundations classes which provide the full flow context of the Ashtanga practice. Please choose one of the following classes to take along with the Sunday Technique class during weeks 4, 5, and 6: Tuesday 7:30 p.m. or Thursday 7:30 p.m. Together the two teaching approaches provide the practitioner a comprehensive approach to the Ashtanga practice. Please contact us to register! We are in our New Home! We begin classes in our new studio this evening at 1213 Dalon Road, Atlanta, 30306. Dalon Road is immediately off Zonolite Rd. The existing schedule remains the same. Sundays at 11:45 a.m. Ashtanga Beginners’ Technique with Elizabeth — think details, alignment, constructing fluidity, exploring breath-body connections and so on…This is a 4 week series course. Please register in advance! Update Oct 16th: the next series will begin November 8th…please contact us to register! Wednesdays at 7:45 with Valerie Ashtanga Beginners’ Flow — Valerie will work with beginner students to put the technique into the context of the fluidity of the full Ashtanga Vinyasa practice. This class is ongoing. We hope to see you in the new space soon!